A month ago I wrote an article for this blog describing how I was inspired by Fit After Fifty’s ebook to begin exercising (“How Did I Get Like This?” – FINALLY Inspired to Exercise”). For whatever reason, I was really resistant to the idea of exercising and watching what I eat, despite having health issues that strongly suggested that I needed to get moving, and fast. Now that I have begun walking every day, I am really encouraged by my progress! I have been experiencing incredible changes, and have realized that the benefits of exercise happen quickly. The picture above was taken just one month after the picture that appears on the monitor to the right. 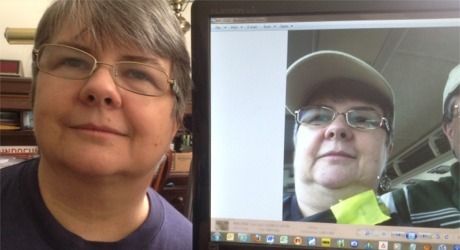 My husband had been telling me that he was seeing big changes, but I would look in the mirror every day and it would seem to me that I looked the same. So he took that picture to prove it to me. I was stunned. Not only am I feeling better about how I look, I am even happier with how I feel. My clothes fit better, I no longer dread going up and down the stairs, and I can easily bend over to tie my shoes. Whereas I was afraid it was time for knee replacements, I no longer have any pain in my knees at all. In fact, I am discovering that I don’t like the way I feel during the day if miss my morning treadmill time! Needless to say, this gives me even more motivation to keep going. In the video below, I was chatting with my friend about a surprising side-effect of my fitness journey. Something very significant has changed about what I WANT to eat. I am no longer enticed by the rich foods I used to crave. Imagine how beginning a fitness regimen could make profound changes in YOUR well-being! Click here to download the free mini ebook that inspired me to start moving. Congrats on deciding to take action and actually doing it! We’re excited to follow your journey and hope others will be inspired to do the same. Thanks for sharing! Healthy eating and healthy living really is no big effort, it is putting it into practice. Congratulations Susan on taking the first steps to changing your lifestyle.